Calvin Shand believes he has the found the perfect match after being appointed as the new manager of Tranent this evening. Shand, who unexpectedly resigned as Musselburgh Athletic manager last month, felt he needed a new challenge and revealed how he can’t wait to get started at Foresters Park. “I’m delighted to be given the chance. As soon as I heard the job was available and there was an interest, it was the right type of challenge for me,” said Shand. “The club is very ambitious and I’ve been really impressed with everything I have heard so far from the committee. 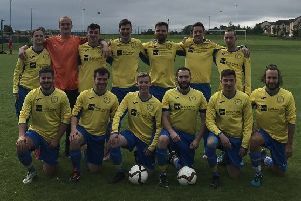 Shand, who lifted the Premier League title with Burgh last season in a division that featured Tranent, continued: “I always said when I left Musselburgh that I didn’t know if it was a break or a fresh challenge I needed; I’ve said that from the minute I handed in my resignation. “As soon as this came up, I knew it was a fresh challenge. You get that feeling about a club and you know it’s right. It had to be the right challenge to get back involved and this certainly is that. Shand replaces Max Christie as manager, the former Broxburn boss having left to take over at East of Scotland Legaue rivals Bo’ness last month.